The 4 x 21 el antennas were in very poor condition when I started this project. There was not a straight element to be seen, and the coaxial cables were waterlogged. Some damage was evident to the driven elements, and these have been repaired. New phased leads, and some work on the preamp enclosure has brought the system back to life. Both rotators need a complete strip down as internal corrosion had taken its toll. A little work was required on the azimuth rotator, but the elevation rotator seemed fully operational. In the end, only 3 of the 4 antennas could be rebuilt, but thanks to John G3XDY, who had a spere antenna, more or less intact, I was able to restore the array. 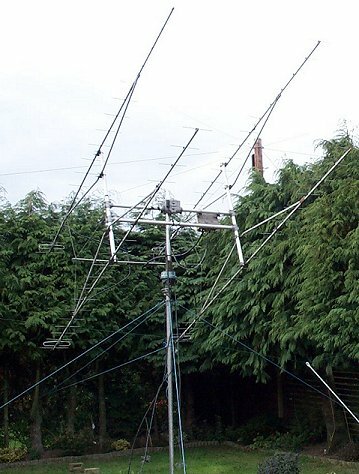 The pole on which the antennas are mounted, and the hinged base plate, courtesy of David GM6BIG have been replaced with a self supporting steel mast base that can be assembeld in about 1 hour. The system is now able to be deployed, used and put away again as required, though reasonable weather conditions are required. On 19 Oct 03 I worked JW/SM2BYA HB9Q and N2IQ on CW moonbounce. This was using a TH326 Triode PA running about 225W. Problems with the elevation rotator and the power amp have kept me QRT since the first QSOs, I have run up GM3JFG's old K2RIW , but cannot get it stable so I am still short of power. More work to do! Signals were immediatley heard and a QSO resulted. 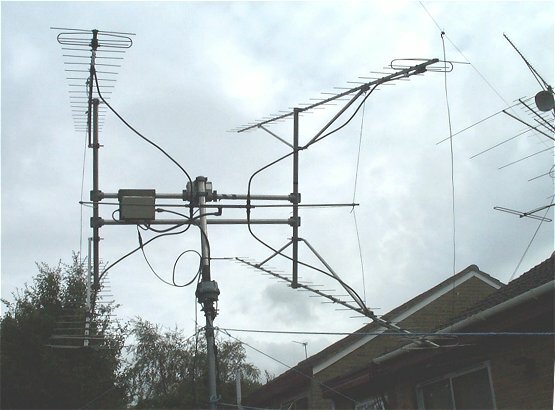 The system was obvoiusly working quite well to make it with a 4 yagi station on EME. The activity during the weekend was a little low, but results were quite good. All initials, grand total 9 now. Problems .. During the weekend of 10/11 Jan, I put the sytem up, and was testing.. I was able to see my own echoes on spectran, weak but unmistakable.. occasional I could hear tones on libration peaks. All super signals.. so I tried echo testing.. Much better echoes than befoe , Os sent in CW could actually be copied coming back! Sequencer failed again.. same sort of relay as before stuck, with the inevitable results . seeking replacement relay and I have change the relay in the sequencer for a different type.